Having not been to Sophia Gardens before, I was a little unsure what to expect. However, having been to international matches before, I knew that I would be at least £60 less well off before I started. Nevertheless, we got in, only to find out they can’t serve until 10am. There was a man with a watch there to enforce it. We made the mistake of going to the first bar we found: Foster’s or Strongbow. I wanted something vaguely resembling beer, so cans of John Smith’s it was. £5 each, plus £1 glass deposit. We mooched around the ground and found bars that sold a better standard of drink (more fool us). We came across the team playing 5-a-side. That clearly meant a late start – not that anyone bothered to announce it. A glance at the Guardian site informed me that the toss was delayed because of the rain. Why do you need to delay a toss? It went ahead shortly and Australia elected to bowl – as you would unless your surname was Hussain or Ponting. I avoided the food because it was ridiculous – right up until I seriously had to eat. I bought a hot dog which was a shade under the £6 everything else was. It was just about edible. A man had an odd shirt on who sat on the steps. We won with plenty to spare and so back we went to our conveniently located hotel. I had to go to Brussels the next day so other than a couple of pints round Cardiff, hoping to run into Gladstone Small, Mike Gatting or anyone, I called it a night. Is Ollie Pope poised to go papal on India? Does anyone know what that would involve? Cardiff is a crap ground and there is yet to be an England match there that isn’t modified by weather. Great match report. Have you got the right photo, though? Wasn’t this one from when you attended the annual general meeting of the Baltic Collective Farmers. The beer situation at Sophia Gardens is unforgivable. They look strong of lung, mark you. In all honesty those big Welsh boyos can sing, I’ll wager. Interesting piece by England’s Team Performance Analyst, Nathan Leamon. One of those links that do what they say on the tin really. Time was when this sort of stuff would get you a triple discardation at the very least. These days it seems to pass without comment. I mean, it’s a lovely report, rather good in fact, but for goodness sake! I blame the internet. Things were much better on this website before the internet. Fair point, Bert, those are excruciating details about the cricket. But Tom might be forgiven for assuming that the visiting Australian side in question was amateur, not professional. Under-19 World Cup qualifiers taking place today in the east of England, for anybody missing the 50-over stuff. Italy played Sweden in the lovely little town of Dunmow. Italy batted first and had Sachin opening for them, but I don’t think it was that one because (a) he’s over-19, (b) he’s not Italian, (c) I don’t think they’d have been bowled out for 86 off 26.4 overs if it had been him. In reply Sweden got more than than 25% of the way towards their target before losing a wicket, which is usually a good strategy in cricket, but then lost 100% of their wickets by the time 19.1 overs had expired, which is a less effective strategy in a 50-over match. Even more so if you are bowled out for 79. For all the deserved opprobrium heaped upon the game’s administrators, I can’t help feeling they deserve credit for the psychogeographical randomness of this fixture. That’s fair play, and very much cricket. On the subject of beer at the cricket, this was an amusing thread of tweets from Edgbaston. I was at Edgbaston on day 1, but had no such luck overhearing drunk men conversations. However we did have a group of work colleagues seated behind us. The passive aggressive comments thrown at the boss and the evident sexual tension between a pair of colleagues was straight out of The Office. Most satisfying. Bit too much cricket mentioned, but otherwise top work. 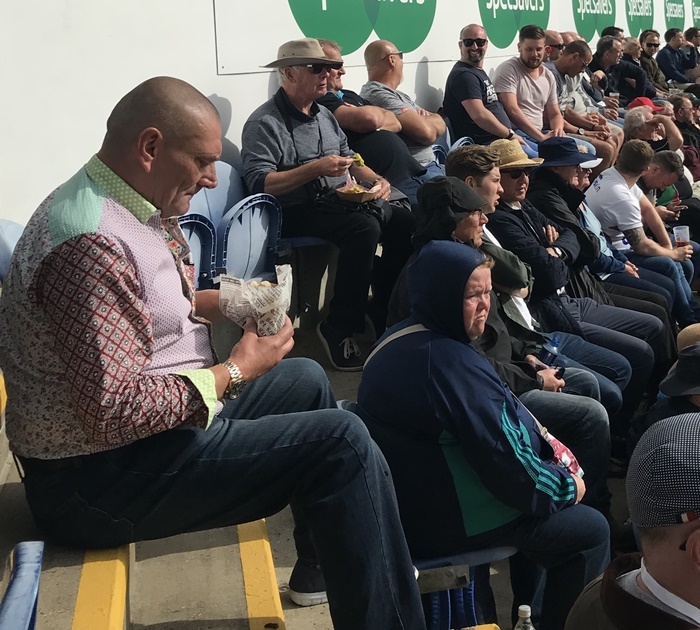 Edgbaston 2018 now written up in an Ogblog stylee. Rather a lengthy piece, but this was a classic.